Since it is pouring down rain outside, and the power keeps flickering off and on, I thought it would be a good time to write my final Gint-A-Cuffs post for 2014. 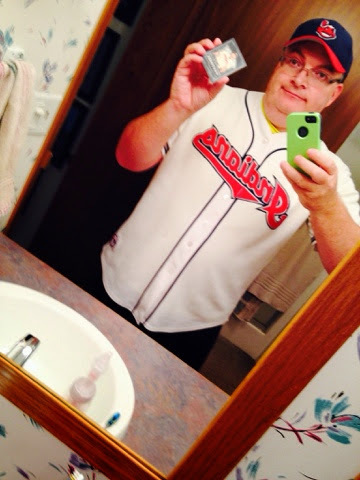 Oh, yeah, and post that 5-point bonus selfie! GAC6 Total: +163.5, Plus whatever points I get for bribing the Commissioner. Wait! Did I bribe the Commissioner!? You bet your sweet buns, I did! I mean, I offered a "Points Adjustment Incentive." I'm not saying anything else about it, so as to allow Mark the pleasure, nay honor, of posting the bribe contents on the GAC site. 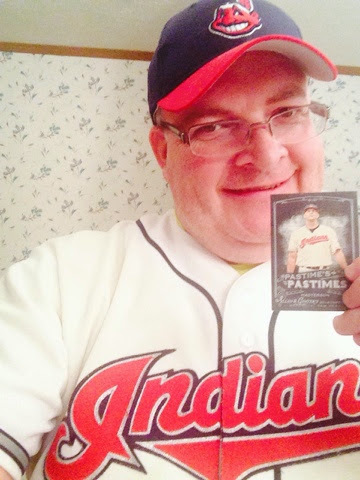 My #GacSelfie displays the Pastime's Pastimes of Justin Masterson - the only insert I pulled for myself, and quite possibly the only INDIANS player I pulled for myself. I can't remember if that is true or not (as far as overall Indians players), and I'm not up to going back to look.